boogie | SOUL OF SYDNEY FEEL-GOOD FUNK SOUL DISCO vibes & beyond. Massive respect to one of Sydney’s finest! What an absolute honor to had Sydneys Disco Edit King, SUPERBREAK closing our the biggest SOUL OF SYDNEY party we have ever done. We covered a massive amount of musical ground at the event, this was his set right after Simon Caldwell to close it out from 12:30am till close in our main room. An hour and half of spaced out FUNK, DISCO and HOUSE flavors. Check out more mixes, edits and more at SUPERBREAK’s page. Get on down for the git down this Sunday 2pm-10pm. 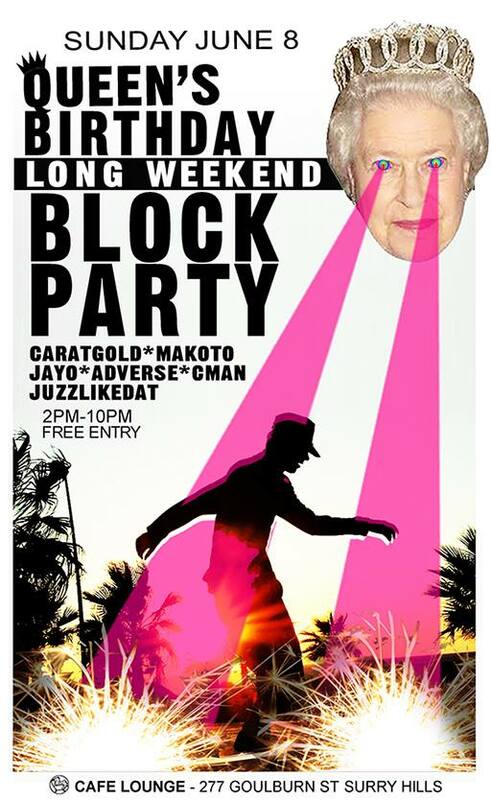 Block-rockin party-starters CARATGOLD, MAKOTO, JAYO, ADVERSE, CMAN, JUZZLIKEDAT are throwing down on the plates more funky breaks,hip hop & disco jams than you can poke a stick at. We’re clearing the tables and laying down the dance floor for an afternoon/evening of good vibes and boogie times at Cafe Lounge. 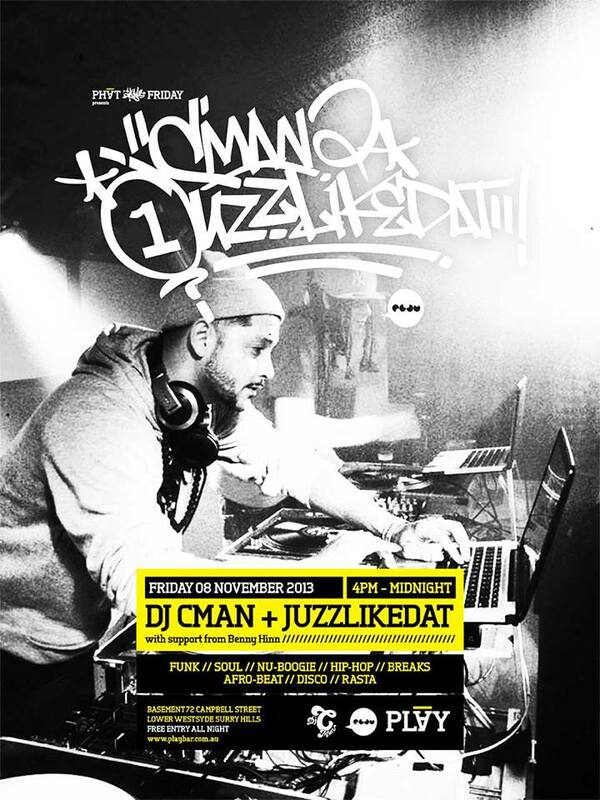 DJ’s CMAN & JUZZLIKEDAT’s afro inspired grooves have been sweeping Sydney with nothing but good vibes over recent years. The guys play host to a stack of great nights around town, such as, “Everyday People” at the Tatler, “Good Good Music” at Cafe Lounge, plus often feature for events at the Basement, Oxford Art Factory, and Ching-A-Lings; as well as Soul of Sydney block parties, and gigs for Funkdafied, and Grindin’. Residing in Sydney, Australia; DJ CMAN has earned a reputation as a versatile go-to dance floor filler and mood creator with his infectious energy and signature ‘funky feel-good’ sets gaining him loyal fans both young and old. CMAN has worked in the music industry for over 10 years and performed at Sydney’s most established venues and events including Home Night Club, Oxford Arts Factory, The Basement, Blue Beat, Four Seasons Hotel, The Cafe Lounge, Ching-a-Lings, the infamous Soul of Sydney Block Parties plus events for Funkdafied & Grindin’. He has played live on numerous radio stations including 2SER and Bondi FM, and supported touring international artists such as Eric Benet, Eric Lau and DJ Sarah Love. Outside of Sydney CMAN has rocked crowds from the VIctorian snow fields to playing internationally in both Europe and South East Asia. The son of an ex-record shop owner, it comes as no surprise the path that he would follow. With residencies across Sydney at some of the coolest underground bars to ritzy five star hotels; CMAN’s dynamic skills, musical knowledge and versatility make him an instant crowd favourite. Rooted heavily in Soul, Jazz and Latin music from childhood, CMAN also grew up on a steady diet of Funk, R&B and Hip Hop. Today he enjoys fusing these influences into his sets with a fine tuned ear and the ability to seamlessly transition through genres; taking patrons on a soulful journey from Funk to Bossa, Reggae to Disco, Hip Hop to Boogaloo and all things in between. Soul, Funk, Rare Grooves, Hip Hop, Disco, Boogie, Latin, Reggae, African, Jazz, Nu Jazz, Retro, 80′s-90′s RnB, Lounge, Chill Out. Gotham, The Local Taphouse (Darlinghurst), Shellbourne Hotel. As a DJ represented by Soul of Sydney, and involved with the Mama Feel Good Funk Collective, Samir Samaali dedicates his Le Garage space to music, art and fashion lovers. Le Garage crosses over as a records store, hair salon and accessories retailer as well as art gallery (and occasionally turning into a music lounge too). With a funk, hip hop & soul sensibility second to none, Juzzlikedat will keep you noddin’ with agreement that yeah, yo, it should be just like that…s’il vous plaît! 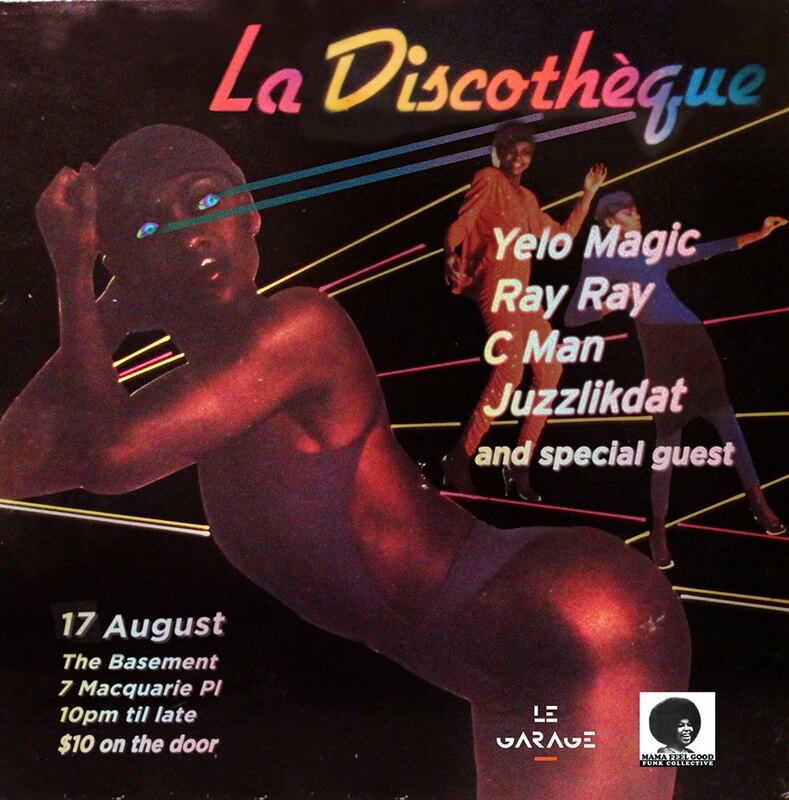 La Discothèque is born from the desire to bring human happiness to your dance floor channelled through funk, boogie, disco and house, old and new. Inspired by the music and inclusive ethos of New York’s heady club scene in the 80s & 90s; La Discothèque will deliver you a belly full of warm and fuzzies and we can’t wait to party with you. $10 donation on the door. Email us at soulofsydney@gmail.com for info. An early pioneer of the disco mix, John Morales was involved in some of the genre’s most important records. John Morales was born in the Bronx, New York. He is recognized worldwide as one of the early pioneers of the disco mix. Having begun his career in 1975 as a local DJ in the Bronx, he also spun records for the US Armed Forces before he settled into the groove of his true calling. Realising he wanted some of the three or four minute-long records to last longer, he started splicing tape with his TEAC and in doing so, arguably invented the ‘extended edit’. After sending some of his mixes to acetate for other DJs, he was soon in demand on an official capacity and ended up being involved in the mix of some of disco’s most important records – big and small. Soul Of Sydney & Our House Sydney are blessed to present a very special June Long Weekend event featuring renowned NYC DISCO & EARLY HOUSE producer and DJ, JOHN MORALES (M+M Productions, BBE RECORDS) & Sydney’s own disco king Stephen Allkins (Love-Tattoo). NYC Disco Legend : JOHN MORALES (M+M Productions, BBE RECORDS). John returns to Sydney after absolutely tearing the roof off our party in April 2012 and playing spots all over the world on the back of his killer new release. John has been involved in the creation of hit DISCO records for the better part of 30 years with over 1000 songs on his own, and as part of John Morales & Sergio Munzibai (M & M Productions). Known in the industry as an innovator and chance taker, John has always welcomed the challenge of working with new artists and can lay claim to being one of the originators of the extended mix, remix and re-edit concept. We are excited to be also be hosting a very rare afternoon set from Sydney’s own home legendary DJ & Producer Mr Stephen Allkins. Being one of the true pioneers of dance music in Sydney & playing the the very first disco clubs & warehouse parties from 1978, it is safe to say that Stephen Allkins aka [love] tattoo could rightly claim the trademark of “Mr.Disco”, his extensive record collection & his infamous sets over the years and legacy is also a testament to that. Expect a very special journey through the disco, funk & early house sounds that matter from the original DJ’s DJ who has seen it and done it all. Who will also be playing along our own Soul of Sydney DJ’s, Phil Toke, Shan Frenzie (Groove Therapy Radio – 2ser), Michael Zac & Eadie Ramia. In 1975 while working as a DJ in local Bronx club, John Morales realised that he wanted to lengthen the duration of some of his records. Back then the duration of most records was 3 to 4 minutes, so by using his TEAC 71/2 and a box of razor blades, John started splicing tape for endless hours and became one the first DJ’s to create the ‘extended mix’ (or ‘remix’ in it’s original form). In doing so, he realised that he could achieve a similar outcome by cutting, slicing and taping parts from different recordings. This formed the basis for his acclaimed (deadly) medleys. John says “I can still see the 100′s of edits zoom by every-time I play the tape”. John Morales started to release some of his reel to reel edits, medleys and remixes to Acetate via the Sunshine Sound (a NYC studio where DJ’s could bring their reel to reel tapes and have acetate copies cut one at a time), so that he could play these tracks at clubs. Greg Carmichael gave him his first mixing job after hearing some of his Sunshine Acetate mixes and these first two official mixes made him famous: ‘Dance and Shake Your Tambourine‘ by ‘The Universal Robot Band‘ and the classic ‘I’m Caught Up” by Inner Life. However some of his early mixes and edits, even those officially released, were and remain uncredited and so might not appear in his discography! John has worked for numerous acts and has been involved in the creation of over 500 songs – both on his own and as part of John Morales & Sergio Munzibai (M & M Productions). John Morales can lay claim to being one of the most important figures in the creation of the extended mix, remix and re-edit concept. Please Note: Our last 4 parties have completely sold out so be sure to lock in a spot on the dancefloor early for this special show. Email soulofsydney@gmail.com for updates and event info.